Learn all about the highly sophisticated and completely addictive stock market with the corporate financial simulation games known as "Wall Street Raider" and "Speculator." These Windows games from Ronin Software are widely recognized as the ultimate in sophisticated financial simulations. "Wall Street Raider" is the sophisticated corporate finance and stock market simulation game, with realistic mergers, tender offers, liquidations, LBOs, IPOs, greenmail, spin-offs, tax strategizing, and all the other tools of high corporate finance. 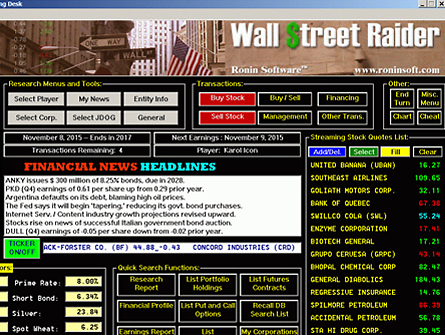 All action occurs in a "live action" economic environment, with a moving simulated stock ticker and scrolling news ticker. Sharpen your business I.Q. and your investing skills with this extraordinarily realistic and addictive simulator. In "Wall Street Raider," you start out as a billionaire and can immediately take over and manage companies, seeking to increase their earnings and stock prices, as well as passively investing and trading, while "Speculator" is purely an investment and trading game, where you start out with only a $100,000 inheritance, as a "newbie" investor. Download and try a free copy of the "Wall Street Raider" shareware version, the basic version with simulated stock and bond trading, commodity futures (gold, silver, oil, wheat, corn) trading, and all types of complex corporate transactions enabled (mergers, spin-offs, liquidations, etc.). Or get your copy of the full version of "Wall Street Raider," which also enables stock and commodity charts, short selling, and put and call options trading, plus other derivatives trading (interest rate swaps), in addition to the stock, bond, and commodity futures trading permitted in the basic (free) version. "Speculator" is the stock trading simulation game, with a simulated "live" investment environment that is similar to "Wall Street Raider." In "Speculator," you are a middle-class, small investor, starting as a novice, with only $100,000 you have just inherited. It's a highly challenging game since you are strictly an investor, not a billionaire who can take over companies and manipulate their stock prices or dominate entire industries. As such, in this simulation, you have to do proper investment research, perusing information on the 1000+ companies, to sniff out undervalued stocks and bonds (including convertible bonds) to get ahead. The game is remarkably realistic and will hone your "real world" investing skills, as you learn to read balance sheets and earnings reports and analyze stock and commodity charts. Initially, as a novice trader in "Speculator," you can only invest in stocks and bonds and aren't allowed to buy stocks on "margin" (borrowed money). As you increase your portfolio, your broker, McSwindle, Churn & Tout, will gradually allow you to use riskier and more advanced strategies, initially using margin debt, then short-selling of stocks, then options trading, and if you grow your account to $500,000 or more, you will be allowed to engage in VERY risky commodity futures trading. Who plays "Wall Street Raider"? The game for Windows XP, Vista, Windows 7/8/10, is played by registered users, ranging from nine-year-olds to hedge fund managers and corporate CEOs in 103 countries and territories around the world. This Wall Street investment simulation is widely recognized as the ultimate in sophisticated financial simulations. It's a corporate takeover and stock market game, in which players strive to build their corporate empires by fair means or foul, all the while trying to stay one step ahead of the SEC, IRS, Justice Department, EPA, Congress, powerful unions, corrupt governments, and ruthless competitors who will crush you if you fall into a weakened financial state. You must also survive various man-made and natural calamities and economic disasters. Version 8.56 of "Wall Street Raider" is now available, and versions 8.00 and higher now allow you to invest in convertible bonds or have your companies issue convertible bonds. Other new features include the ability to reset the default currency exchange rates and a new stock price alert feature which will alert you when a stock reaches a price you have specified. Interest rate swaps (derivatives—"bets" on future interest rates) that you negotiate have been added as another tool for hedging or speculation.